NEW YORK, May 18 /PRNewswire/ -- Michael D'Antuono, the artist who gained notoriety as the creator of "The Truth", the highly controversial painting depicting President Obama in a crucifixion-like pose, has created a new work in an effort to remake his original political statement without the use of religious symbolism. The new work, appropriately titled "...what I meant was..." is a response to the thousands of people who decried his work as blasphemy. "Unfortunately, too many people were unable to see beyond the religious symbolism of the first painting to be able to appreciate the political statement I was trying to make," says D'Antuono. The new painting, to be released on May 18, 2009, portrays President Obama at a press conference. The reporters are wearing 3-D movie glasses with the color of their lenses representing their respective political views. The message the artist is sending with his new piece is clear. He is deeply troubled by the current condition of the fourth estate. "The media views events through their partisan lenses and then spins the news for the purpose of advancing their own political agenda. The end result is a country that is passionately divided," says D'Antuono. With his latest painting, he is challenging the media to be less partisan in its reporting and the viewer to be more discerning between fact and opinion. D'Antuono's painting "The Truth" gained international attention on television, radio and especially the internet. It became the most emailed photo on Yahoo! and wound up on Wikipedia until an offended party had it removed. The artist feels that his point was proven by the diverse reaction to the piece and by the divisive nature in which both the right and left wing media covered "The Truth" in an effort to provoke and mobilize their respective audiences. What do I think? I think you completely missed the press bias point in your painting. First of all, you portray the red and blue lense folks at an Obama press conference in about equal porportions. In reality there would be maybe one or at the most two members of the press wearing red lenses and the rest of the room would be decked out in blue lenses. Also the folks wearing blue lenses would be not just outright leftwingers like Helen Thomas, Keith Olbermann, or Rachel Maddow as your painting depicts. It would be much more accurate if folks laughingly attempting to pass themselves off as neutral, such as Matt Lauer, Brian Williams, or Katie Couric were in that press room wearing blue lenses. 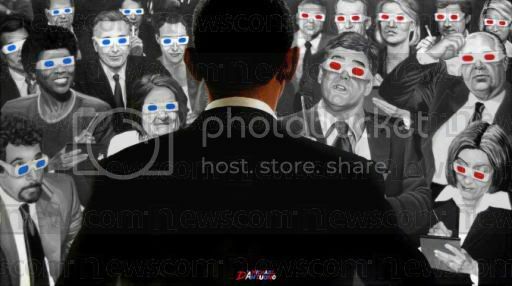 Therefore I am issuing a challenge to anyone (including even Mr. D'Antuono) to produce a more accurate painting depicting press bias that I have suggested with "neutral" journalists wearing blue lenses and with the correct ratio of blue vs red lenses that is allowed into an Obama press conference. If someone can produce such a painting in the Michael D'Antuono style, I will even feature it in this blog posting as an update. Just post on it the web and provide me with the link for analysis and judgement. p.s. Is that El Rushbo scratching his head?